A corpse flower named Morticia is blooming inside the Amazon Spheres in downtown Seattle, just in time for Halloween. A corpse flower named "Morticia" is blooming inside the Amazon Spheres in downtown Seattle — and you can watch it live. Amazon is streaming the plant's bloom on Twitch. This is Morticia's first time blooming, which only last about 48 hours. 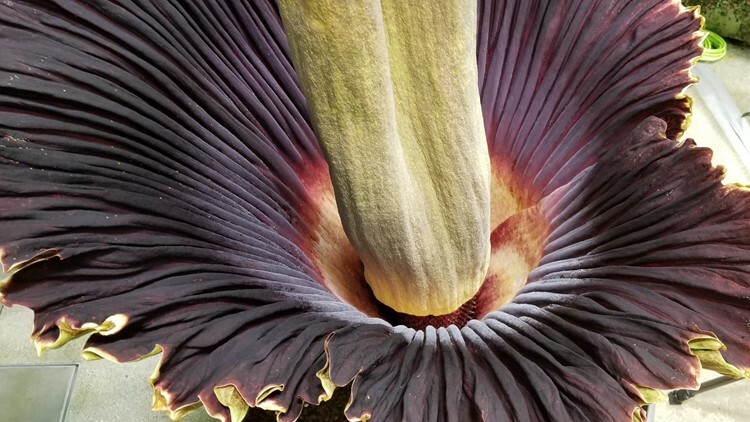 The plant's scientific name is Amorphophallus titanum, but it is better known as a corpse flower for the rancid smell it produces in bloom. It is native to Sumatra and attracts flies and carrion beetles with its odor of rotting flesh. The plant also heats up to 98 degrees to help spread its scent. The University of Washington donated the plant to Amazon in 2014. Morticia is believed to be between 7 and 10 years old. Amazon's horticulture team says they brought Morticia into the Spheres on September 19 from their backup greenhouse. At that time, the plant was just 19 inches. By early October, Morticia had sprouted to more than 52 inches high. Morticia was 75.7 inches tall Friday night when the plant was in bloom. The horticulture team says they will attempt to pollinate Morticia over the weekend with pollen from another corpse flower at the Missouri Botanical Garden in St. Louis. Amazon says the plant is visible from 6th Avenue in downtown Seattle on the second floor of the Spheres, just in time for Halloween. The Spheres are not open to the public on a daily basis. Visitors can schedule a tour two Saturdays a month, by reservation only. Saturday, October 20, one of the days Morticia will be in bloom, is one of the Saturdays the general public can visit.